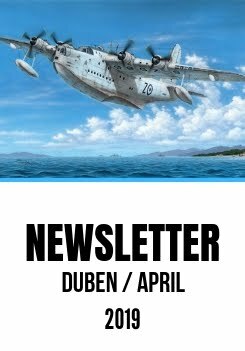 The April instalment of our regular monthly newsletter is here now bringing another batch of Special Hobby new models for you. If you are interested to know what models are just being prepared for modellers and what is to come in the near future, do watchalso our blog and follow us on facebook. Of the same importance will be the note about models that have already been discontinued or are just about to be. Please, remove from your databases the models that have been labeled as definitely sold out and do not make orders for them any more. And it is also your last chance now to order the models that are about to finished. The Junkers Ju 88 belongs to one of the most famous desings being used by the Luftwaffe during WW2. Several versions were produced, depending on various service requirements, these being the bomber variant, day or night fighter, attack and anti-tank verison and at last but not least the reconnaissance type. The suitability of the latter was verified by the Luftwaffe during the trials with several airframes known as the Ju 88A-5(F) and Ju-88D-0 which had the provision to carry photographic cameras in the bomb bay rear section, extra fuel tanks in the front bomb bay and also had their speed brakes removed from beneath the wing. The Ju 88A-5 airframes served as basis for the dedicated recce versions of Ju 88 D-2 and D-4, the latter being adapted for service under tropical conditions. The Luftwaffe made use of their recce Ju 88Ds both in the east and west on all fronts from the Arctic Circle to the deserts of Africa. The recce Ju 88Ds were also delivered to German allies namely Rumania and Hungary. Both these satellites saw the Ju 88s operated on the Eastern Front, following the Rumania´s changeover to the Allies, her Junkers airplanes were also put into action against the Wehrmacht. Handful of Junkers airframes were also captured and test-flown by the Allies. There might be some similarity in the genesis of our Ju 88 D-2/4kit with the origins of the recce version as we have taken the A-5 version parts and added newly designed injection moulded parts (some clear ones also) as well as resin parts (cameras, u/c wheels and a tailwheel). The decal sheet has markings for three machines. There is an option for a German Junkers operated in Africa, another one from Norway and the third option is a Royal Hungarian Air Force airframe. The kit has been produced in a limited edition. Following the end of World War Two, the British Air Ministry issued Specification T.7/45 calling for a three seat training aircraft which should replace the North American Harvard in the training scheme of both the FAA and RAF. Initially, a turboprop engine was considered for the design, however a standard piston engine in the shape of a reliable Merlin Mk.35 type was prefered also because of cost issues. The earlier concept of a three-seater aircraft was also left in favour of a two seat cockpit arrangement. One of the aircraft designed to these specifications was Baulton Paul´s type Balliol T.2/Sea Balliol T.21 which became the final military type to be driven by the famous Merlin engine. The Balliol was a highly interesting machine having a folding wing of a laminar airflow cross-section and a huge cockpit with side-by-side pilot seats. For the use of the RAF, the T.2 version was produced and the machines saw service mainly with No.7 Flying Training School at Cottesmore and the RAF College at Cranwell. The navalized T.21 vesion was delivered to the FAA having a special naval equipment, arrester hook, smaller-diameter propeller, strenghtened undercarriage legs and hydraulically operated folding wings (the original Balliol design featured manually operated folding system). The production gave a total of 196 T.2s and another 30 of the navalized T.21s. The latter saw service with FAA training units as well as aboard HMS Triumph, then a cadet training ship. The Balliol / Sea Balliol remained in service until the early 1960s when they were replaced by more modern jet engine powered types and were offered for export to the Royal Ceylon Air Force. The RCyAF made use of a dozen of refurbished airframes, six of which were lost during their service with the RCyAF, the survivors withdrawn in the late 1960s. Baulton Paul company had also one airframe in use as a demonstrator, being painted plum red overall with white trimmings, bearing civil registration G-ANSF and serial VR603. Our re-issue of the Balliol kit caters for company demonstrator machine G-ANSF and two Ceylon machines. The decal sheet brings also detailed stencils. Besides the styrene parts, the kit contains also resin parts along with undercarriage wheels and fuel tanks and a set of PE parts. The kit allows for a folded wing option by means of resin parts. Finland was the only country where the Brewster model 239 fighter (known as the Buffalo in the US or UK) was liked by its crews. The reason might be that the Finnish operated the first lightweight version of the aircraft which was affectionally called by their pilots as the Taivaan Helmi (Sky Pearl) or just simply as the Brewster. Until the arrival of German Bf 109 fighters, the Brewsters had become the most successful figter type of the Finnish Air Force. Our model of this version was originally produced for Classic Airframes, but as we have recently obtained production rights and moulding tools from this company, we are able to offer the Sky Pearl to the modeller now in Special Hobby range. One of the kit´s moulding tools was rather damaged by the wear and tear and we had to replace it by a new one. The model brings two machines in three camouflage options, one of them as flown by the most successful Finnish pilot Hans Wind.
" In RAAF and USAAF colors"
The Buffallo fighter is an aircraft full of contradictions. The first version to be produced was the F2A-1 (model 239), which although originally developed for the US Navy, was in fact used by Finland. Until the arrival of Bf 109 fighters, the Buffalo was the most successful of the Finnish fighter machines. The next versions, which were the F2A-2 and export models 339C/D and 339E were equipped with more powerful engines but also received much more equipment, armour and heavier armament which had negative effect on the type´s rate of climb and manouverability. This fact, together with the conditions that the type had during its premiere in the Pacific Theatre of Operations with the enemy possessing the moment of surprise almost all the time, stood for the Buffalo´s notorious reputation in the Pacific war. Not even the final and most powerful version, the US Navy F2A-3 did find any success. It was made famous during the Battle of Midway though, but its losses were unbearable. Simply, the Buffalo fighter was always inferior to its rivals, the Japanese A6M Zero and Ki-43 fighters. The naval F2A-3 naval version was identical to the export variant model 339-23 that was ordered by the Dutch East Indies Air Force hoping to replenish their 72 earlier-delivered planes of model 339C/D. But the war in the Pacific had broken out even before the aircraft could be delivered. All the machines of this batch were on their way when the Dutch East Indies capitulated and they were diverted to Australia. The RAAF were short of suitable fighter planes so they greeted the arrival of the Buffaloes and put them on duty. Within the RAAF, the Buffaloes flew in recce and patrol roles with 1.PRU and later also with several squadrons until 1943 when they were handed over to USAAF units based in Australia. There, they served for training purposes. The kit´s plastic parts were acquired from Sword company, we have 3D-designed new clear parts and also new resin parts. The decal sheet offers two RAAF machines and two USAAF machines. YAKOLEV YAK-3 "Onward to Berlin!" 100-SH72350 SB2C-5 Helldiver "The Final Version"
SH72361 Gloster Meteor Mk. 4 "World Speed Record"
Please note, that these CMK kits are sold out. Following the correction sets with new ailerons and flaps, we have prepared also a new and detailed undercarriage bay set. The original parts in the kit are rather shallow and lack most of the details. Our set features all the surface details. The set includes a new rudder and tail planes with separate elevators and brings the option to portray the control surfaces in deployed position. No need to modify the kit. The set offers new and separate ailerons (the kit has ailerons moulded with wing parts) and enables the modeller to attach the ailerons in deployed position. This nicely detailed set offers the option to open the upper fuselage inspection hatch and attach a resin engine replica into the fuselage. Besides that, the set brings also the swivelling jet nozzles and fuselage hatches. The control surface set includes separate ailerons, flaps, tail fin and a rudder. All the cast parts feature nicely engraved lines and inspection panels. This detailed cockpit set includes the cockpit tub, ejection seat with the belts, control column, instrument panel, side consoles and some other smaller parts to enhance the detail levels of the Airfix kit. The resin instrument panel is very thin. The set brings the Soviet RSI 4 Radio Receiver that was used during the WW2 era for example in Yak-3 fighter airplanes.